Notes: Often, the first question that pops up with this pattern is, what is an "aftershaft"? An aftershaft feather is the smaller feather that is directly behind the dominant feather on a cape. It is intended to give additional insulation to the bird. Aftershaft feathers vary in size and shape, depending upon the bird. Some earlier patterns referred to this feather as a "filoplume" in error. The aftershaft is tied on top of the hook, not wrapped. Form the abdomen first, then pull the aftershaft over the top of it. Imitates the nymph of a Hexagenia mayfly (big yellow may). 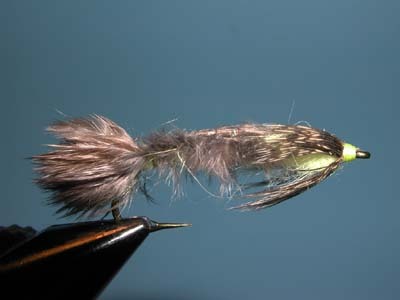 These nymphs have large gills along the abdomen, and one of the keys to this fly's effectiveness is the aftershaft pheasant "gills." Hexagenia nymphs burrow into the silty bottom of some lakes and slow-moving rivers. They are rarely available to trout until they start to hatch. The hex hatch starts after sunset, but a few hours before duns start appearing on the surface, the nymphs become active and are sometimes taken by trout. So a couple of hours before sunset, drop this fly near the bottom and use a lift-and-settle retrieve. Once the hatch is underway, try retrieving the nymph quickly to the surface.